Carl Deuker's Official Website - Available April 1, 2007 in a new edition from Little, Brown & Co.
"Baseball becomes a metaphor for life in Deuker's thought-provoking testimonial to friendship and filial love. . . .The sensitive examination of the importance of a father--or lack of one--in a boy's life is where Deuker really hits a homerun." Available April 1, 2007 in a new edition from Little, Brown & Co. I had to write you to tell you about an amazing thing that has just happened. But before I do, I would like to tell you about myself. My name is Jeffrey and I am currently 25 years old. I have spent my whole life in Huntington Beach, Ca until recently when I moved an hour up north to North Hollywood to live in my deceased grandmother's house. This led to a lot of nostalgia taking place, but I had no idea how much this would lead to. My story actually begins when I was 11 years old in fifth grade. On Jan. 4th, 1994 my father died of a heart attack in his sleep. Sometime within the next year in sixth grade, I found your book "Heart of a Champion." I was hooked with it from the beginning. This astonished me because I do not read books. To this day, when people ask me about what books I like, I tell them "Actually, I don't like to read books, but there was one book back in my childhood that I loved. It is the only non-school assigned book I have read cover to cover." Sadly, sometime after reading it, I lost the book and could never find what happened to it or the exact name of the book. Since, I never spent much time in bookstores or sadly even libraries I figured I would never come upon it. This is where the story gets strange. Recently, since moving to North Hollywood, I have been taking an hour and a half long train ride to work most days and have been wanting to find a good book or two to read while heading to work. Last week on July 20th, I took my fiancee to Target to get her a birthday present . After we found her present, we headed over to the book aisle because she LOVES reading books of all kind. This made me start looking as well. That is when I found "Heart of a Champion" on the bottom shelf. I quickly scanned through it and said, "This is THE BOOK! This is the book I always talk about." Out of everywhere to find it, I found it in a Target near my new home that carries maybe 100 books. This morning I finished it after 3 days of reading and I remembered why I loved it so much. I have always been a huge baseball fan , and the richness of the baseball text would hook me into a scene and let me visualize the scenarios in my head and create so much suspense. However, while that was amazing stuff to read, the real "heart" of the movie was the relationships Seth had with Jimmy and, even more important for me, his mom. I can relate to Seth so much. The feelings of having a friend who had a dad, no matter how bad he was, and thinking how lucky he was and didn't even know it are feelings I have had many times. Then the conversations with his mom about what Seth's dad was like and how he would do the smallest of things that would remind the mom of his dad. My mom and older sister have always been telling me small things about my dad that are hard to remember and telling me I remind them of him. Ultimately, one thought of Seth's has stuck out for me. This is right near the end when Seth knows that there is a hole in him, an emptiness that should have been filled by his father. This emptiness has always been with me, throughout my childhood, my graduation from high school and college, as well as my relationship with my fiancee, Kristina. Lately, the emptiness has been very present as I think about the man my father was and how he took care of a family and did everything the man of the house should do. In just over a month, on August 30th, I am getting married and the only thing that could make my life better would be if my dad was around to see me get married. I would pick his brain for everything. I would ask him if I have made him proud over the last 14 years. I would want to know how he liked my bride and everything about her, and maybe most importantly, I would want every ounce of advice that only he could give me on being a husband and hopefully in a few years, a father. I wanted to write you to thank you from the bottom of my heart for writing this book and somehow letting this book find me twice in my life at very different times and ironically at very similar times . I have always been a huge believer of fate and think that this has given me a great reason to believe that somewhere someone is looking out for me and my family. As I wrap this up, I wanted to ask you a few questions that I had. How did you come about writing this story, especially the stuff about Seth and losing his dad and the subsequent relationships with his mom and Jimmy? Secondly, I am a big movie fan and one of my favorite movies is the Sandlot. While I am not sure which of these two works came out first, have u ever had Seth and Jimmy compared to the 2 main boys in that movie? As I read this book, I have to admit those were the 2 kids I visualized in my head as Seth and Jimmy. Thank you once again for this amazing work. 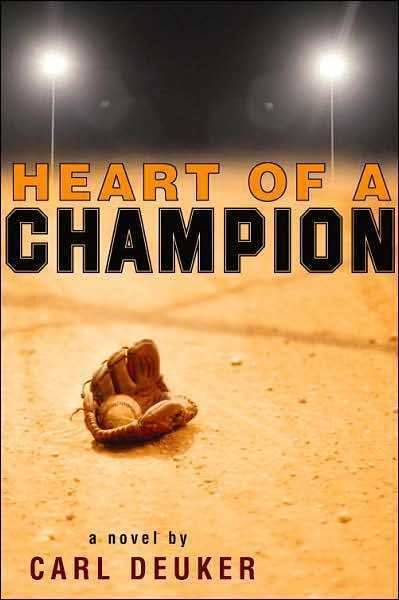 To buy Heart of a Champion, please click here. This is the road leading from Huddart Park where the accident happens. Sometime in there winning the games became as important to me as it was to him. I could feel how badly he wanted to beat me, and that made me want to make sure he didn't. They were stupid Wiffle-ball games in the garage, but we played like they were the World Series. We crashed into the wall to take away doubles and triples; we argued about balls that hit on the line; we shredded our elbows trying to throw rainbow curves and hard sliders. We must have played twenty games that weekend, and I won all of them. when Jimmy left Sunday, we were hardly talking. Seth and Jimmy have the kind of friendship you can't put into words--the kind you think only happens in movies. They both live and breathe baseball, but while Seth struggles to be good enough to make the varsity team, Jimmy, a natural, looks like he's on his way to becoming a major league star some day. On and off the field, their passion for the game gets them throughsome of life's bittersweet struggles and unites them in a once in a lifetime friendship that is meant to last forever. . .